If you're looking for something to do on New Year's Day other than sitting on the couch watching football, you should try heading out to the season opener at Topaz Lake. 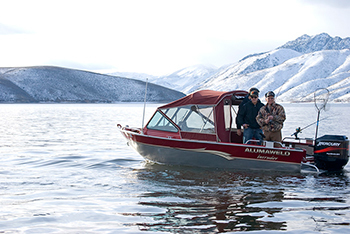 The lake has been closed to fishing since September 30, but it will be open for fishing again on Jan. 1 in one of Nevada's more unique ways to celebrate New Year's Day. "To most people, New Year's Day means the Rose Parade, bowl games and recovering from the fun you had the night before," said Chris Vasey, Conservation Education Division Chief for the Nevada Department of Wildlife (NDOW). "But to anglers in Northern Nevada, New Year's Day means opening day at Topaz." Topaz Lake is located along Highway 395, south of Gardnerville along the Nevada-California border. Boat launching is available at Topaz Marina and Douglas County Park. Douglas County Park additionally provides camping, electrical hook-ups, bathrooms, picnic tables, and a playground. The Topaz opener is always a party in Douglas County. Many people spend the night at the lake and wake up the next morning and start their New Year's Day with some fishing. NDOW has been getting ready for the opener since early fall by stocking over 50,000 trout. "Whether you've had a night out on the town or just bringing in the New Year, it's a great way to spend the day," said Vasey. Once again, Topaz Lodge will be running its annual fishing derby from Jan. 1-April 16. Catch a tagged fish and win instant cash and free slot play. Each Topaz Lodge tagged fish will be worth $100 cash, $10 in free slot play plus five entries into the drawing. You can learn more about the derby at www.topazlodge.com. Fishing is open at Topaz Lake Jan. 1 – Sept. 30, one hour before sunrise to two hours after sunset, except for the area within the jetties of Topaz Marina, which is closed to fishing. Daily and possession limits are five trout, 10 mountain whitefish, and 15 warmwater game fish of which not more than five may be black bass. Persons under 16 years of age are not required to have a fishing license. Those anglers, 16 years of age and older, must have a Nevada fishing license and a trout stamp, a Nevada short term fishing permit, or a California fishing license. Two-rod stamps are valid in both states. The Nevada Department of Wildlife (NDOW) protects, restores and manages fish and wildlife, and promotes fishing, hunting, and boating safety. NDOW's wildlife and habitat conservation efforts are primarily funded by sportsmen's license and conservation fees and a federal surcharge on hunting and fishing gear. Support wildlife and habitat conservation in Nevada by purchasing a hunting, fishing, or combination license. Find us on Facebook, Twitter or visit us at www.ndow.org.